JACKSON, Miss. – Ole Miss sophomore wide receiver A.J. Brown is one of 10 finalists for the 2017 C Spire Conerly Trophy, the Mississippi Sports Hall of Fame and Museum announced Monday morning. The C Spire Conerly Trophy, which goes to the most outstanding college football player in Mississippi, will be presented Nov. 28 at the Hilton Jackson. Brown, a sophomore from Starkville, Mississippi, leads the SEC and ranks seventh nationally in receiving yards per game (98.6) and is tops in the SEC in touchdowns (10). 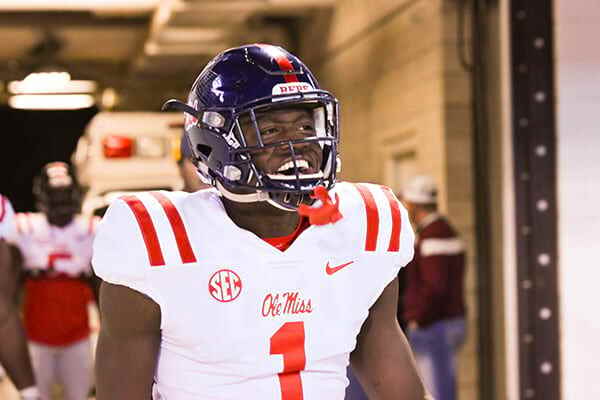 Brown’s 1,085 receiving yards currently ranks third all-time in a single season for an Ole Miss receiver, just 68 yards behind 2015 Biletnikoff Award finalist Laquon Treadwell’s mark of 1,153 yards set in 2015. Brown’s five 100-yard receiving games this season ranks second in the single-season record books for 100-yard games, just one shy of Laquon Treadwell’s 2015 mark of six. Brown currently ranks fifth on the single-season record charts in receptions (69). Earlier in the year, the Starkville, Mississippi, native hauled in eight receptions for 233 yards and two scores vs. South Alabama, breaking Eddie Small’s Ole Miss record of 210 receiving yards set versus Vanderbilt in 1993. Brown’s total of 233 yards also tied Pharoh Cooper of South Carolina for the 13th most receiving yards in a game in SEC history. His two TD catches of 71 and 77 yards also marked the first time in school history a receiver posted two 70-plus yard touchdowns in the same game. Other finalists are Alcorn State RB De’Lance Turner, Belhaven QB Hunter McEachern, Delta State RB Chris Robinson, Jackson State LB Shawn Bishop, Millsaps LB Jacob Kendall, Mississippi College DB Chris Manning, Mississippi State QB Nick Fitzgerald, Mississippi Valley State DB Mark Pegues and Southern Miss RB Ito Smith. The C Spire Conerly Trophy is named for former Ole Miss and NFL quarterbacking great Charlie Conerly. Six former Rebels have won the Conerly Trophy, including Stewart Patridge (1997), Deuce McAllister (1999), Eli Manning (2001, 2003), Patrick Willis (2006), Bo Wallace (2012) and Evan Engram (2016). In 2014, McAllister, the leading rusher and touchdown scorer in Ole Miss and New Orleans Saints history, was the first C Spire Conerly winner to enter the Mississippi Sports Hall of Fame. This year the C Spire Conerly Trophy will be presented at the Hilton Jackson in Jackson, Mississippi, on Tuesday, Nov. 28. A reception begins at 5:30 p.m. with the program beginning at 6:30. Tickets are available online at www.msfame.com or at the Hall of Fame offices. For a list of previous C Spire Conerly winners, visit www.msfame.com/events.